Honey baked hams make a wonderful addition to the table at any family gathering. Their rich taste and sweet, crisp exterior are what make them so popular. 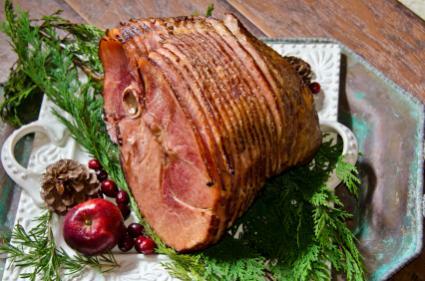 Make your own honey baked style ham using this simple recipe. Place ham in a glass 8-inch square baking dish, cut end down. Use a blender to combine the juices, honey, sugar and spices above. Bake ham for approximately one hour, basting frequently with the glaze until the ham reaches an internal temperature of 140 degrees. Broil, watching carefully, for the last five minutes. Let your ham sit for a few minutes after cooking to help the juices properly distribute. Slice around the bone to free it, and then divide your ham into three sections: one horizontally above the bone and two below it, one to each side. Serve your honey baked ham with scalloped potatoes, green beans, and fresh rolls for a meal your guests won't soon forget.